The candy in an average trick-or-treat bag can contain as much as 7,000 calories and all that candy can lead to tooth decay and a lot of extra pounds for the entire family. What’s a health-conscious parent to do without ruining one of the most kid-friendly celebrations of the year? There are alternatives to candy for your child’s trick or treat bag and ways to make Halloween healthier for your family. crackers or trail mix. Or, if you want to avoid giving out candy or snack foods altogether, give small toys, stickers, temporary tattoos, pencils, Halloween erasers or glow-sticks. 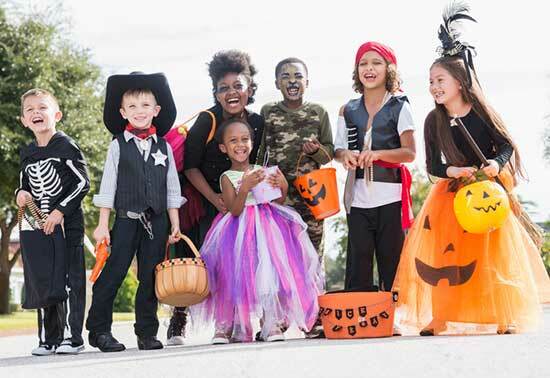 Kids receive plenty of candy on Halloween and will enjoy being surprised with the “extras” they gather while trick-or-treating. Get out and exercise. Candy consumption certainly increases on and around Halloween, but so does walking. Fitbit recently analyzed its data and found the average user walked an additional 2,750 steps on Halloween. While those extra steps won’t cancel out all those candy bars you ate, the added walking and exercise can help you control your weight and improve your health. Take family walks around the neighborhood before Halloween to plan your trick-or-treating route. The additional movement can benefit the whole family. are properly fueled and less tempted to snack their way around the neighborhood. Plus, for safety you should save your candy until you get home to screen for anything potentially hazardous. If you return home and your family has more candy than they should eat, search online for a local dentist or other business participating in candy-donation or buy-back programs. Call first for each location’s program details.